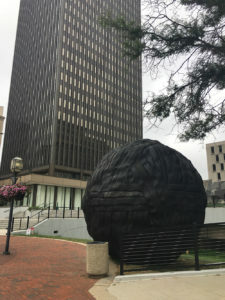 Giant Rubber Ball Appears Outside CTI Akron | CTI Engineers, Inc. Yes, you read that right. 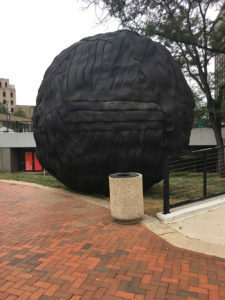 A giant rubber ball, made of tires, has appeared on the plaza outside of CTI’s Akron office. The ball appears to be composed of tires wound together, similar to how a baseball or a golf ball is constructed. The ball arrived on the plaza sometime in the past few weeks. Most of the neighboring businesses are unaware of the ball’s origins or purpose. In fact, an online search found no mention of the ball whatsoever. Additionally, a significant road construction project on Main Street in front of the ball limits the amount of visibility for the quirky addition. Whatever its origin or purpose, the ball has become a new and interesting landmark outside of CTI’s Akron offices.